Join the sponsors and many leading experts. Welcome first time visitors. Share this announcement about CTMF 2019 with others. Who is SME? and NY SME? The Society for Mining, Metallurgy & Exploration Inc. (SME) www.smenet.org is an international society of AIME that is headquartered in Denver, Colorado. It comprised of more than 14,000 professionals serving the minerals industry in more than 100 countries. SME members include mining executives, engineers, geologists, metallurgists, educators, students and researchers. SME advances the world wide mining and underground construction community through information exchange and professional development. SME is a member society of the American Institute of Mining, Metallurgical and Petroleum Engineers. The New York Section of SME www.smeny.org is a unit of the SME encompassing the Tri-State area including parts of New York, New Jersey and Connecticut. New York SME members are given the opportunity to network with peers and hear valuable presentations through New York SME activities including dinner meetings, receptions and on occasions seminars. New York SME dates back to 1871 when a handful of mining engineers in New York City founded the American Institute of Mining, Metallurgical and Petroleum Engineers (AIME). What is CTMF? - the Current Trends in Mining Finance Conference? The SME's annual Current Trends in Mining Finance (CTMF) conferences first started in 2013. It was conceived to provide a unique opportunity for a wide range of subject matter experts involved in the financing of mining projects and activities world wide to meet one on one with and hear many leading industry experts discuss the key issues impacting the raising of capital in the mining industry world wide. 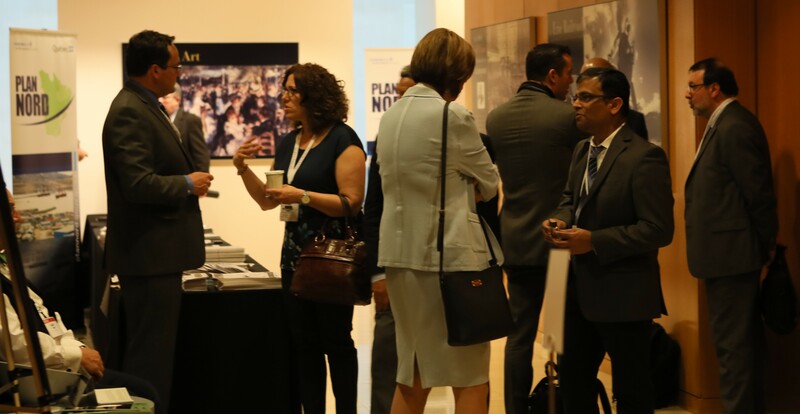 The format of CTMF events, including workshops, the conference and receptions allows delegates to get questions answered by key decision makers in the mining and finance industries, including from the principal professional advisory firms. Speakers at the CTMF conference and pre and post-conference workshops present case studies on how management and investors employ best practices and technology to anticipate, track and manage the technical and non-technical and financial risks associated with mining projects around the world. The use and adaptation of technology and innovation by the industry has consistently been core to the event agenda. Intended for senior executives and mining industry specialists including engineers, bankers, financial analysts, investors, portfolio managers, service providers, government officials and others the CTMF conference, workshops, and receptions bring experts together from around the world to discuss trends and a range of important topics, solutions and risks and opportunities. Titles of attendees include: CEO, President, Partner, Executive Director, Project Manager, Banker, VP, Engineering & Development, Corporate Finance Specialist, CFO, Treasurer, Consultant, Managing Director, Geologist, Corporate Strategist, Investor, Environmental Specialist, Engineer, Mining Engineer, Lawyer, Financial and Equity Analyst, Accountant, Portfolio Manager, Controller, CTO - Chief Technology Officer, Global Leaders of Mining and Natural Resources, Founder and Community Engagement, Investor Relations Officer and Appraiser. Present at the 2018 CTMF events were representatives from more than 42 mining companies and more than 290 bankers, investors, analysts, advisers, engineers, and government officials in total. About 60% of all CTMF attendees traveled from outside New York to attend the events, from more than 21 countries including from Argentina, Australia, Bolivia, Brazil, Canada, Chile, China, Colombia, Germany, India, Japan, Kosovo, Mexico, Peru, Portugal, South Africa, Spain, Turkey, the United Kingdom and Uruguay. Check back for updates to the program and agenda. We hope you join us! All attendees, including speakers must register in advance to attend the conference, any of five workshops and three receptions. All delegates and speakers can register at a discounted rate, if you register early. Space is limited. You can pay on line by visiting the registration tab where you can see the fees and schedule of deadlines. Registrations will be monitored, and may need to be closed before the event. The organizers reserve the right to limit and or restrict attendance. Registration closed early in 2018 and 2017. Your confirmed conference registration includes access to the conference on Monday April 29 and Tuesday April 30, a breakfast, lunch, refreshment breaks and reception on both days. All must register in advance to attend conference events. We hope to have adequate space for attendees to attend the sessions on Monday and Tuesday. As Space is Limited*, the organizers may ask some to be present in a second boardroom that will have live video and audio feed to the main conference, and or attend in a third board room to watch and hear via live audio/video feed. Additional rooms and space adjacent to the main conference room are places to relax, network, meet one on one, for quiet phone conversations, or work. The organizer reserves the right to close registrations in advance of the event. Visit receptions for locations and details about the Sunday April 28, Monday April 29 and Tuesday April 30 receptions. There is an additional charge to attend the evening receptions and any workshop on Sunday April 28 afternoon and on Wednesday May 1. Registered conference attendees are registered to attend the Monday and Tuesday evening receptions. Everyone needs to register to attend the Sunday evening reception, except for those registered to attend the Sunday workshops. To attend the receptions and any of the workshops you do not have to attend the conference on Monday and Tuesday, though you must register in advance. It is advised to register early as space is limited, especially for the Sunday reception. As regards cancellations and substitutions - see below. Are there any continuing education credits offered for this conference? At this time, there are not continuing education credits for attending the conference. This may change. The organizers welcome your suggestions to do so and to improve the event. Please let us know. The event is attended by many leaders working around the world from the mining, finance, bank, investor, advisory, engineering, accounting, legal sectors that present priceless insights about trends in the industry. Can I exhibit at this conference? Recording of proceedings, Media, etc. All four display tables available at the CTMF conference are located in the entry foyer between the main conference and board rooms. Please refer to the sponsor tab or contact Tim Alch, Conference Co Chair at timalch@gmail.com to discuss this and other sponsor levels such as displaying pop-up banners etc. NY SME greatly appreciates the support and all of the sponsors and partners. NY SME asks all participants and attendees to limit recording of CTMF events to snap shot photos. The organizers may use photos and or otherwise other recordings of the events in future promotional and or marketing, etc. materials. Members of the press and media are welcome and will be present. All must register in advance. What about Cancellations, Refunds and or Substitutions? Space at all CTMF Events is limited. Register to attend as soon as possible. There are no guarantees that all registrants will be able to attend, and or all be in the same event room. NY SME will do its best to inform all about remaining space, availability etc. and assumes no liabilty(ies) associated with changes and or its stopping registrations in advance of the conference dates. The conference organizers reserve the right to limit and or restrict attendance. There are no refunds after March 31, 2019. All attendees must register. A $30 processing fee will be assessed on ‎cancellations prior to March 31, 2019 and‎ on substitutions made without advance written notice. Cancellations must be received in writing before March 31, 2019. A substitute delegate is always welcome, but the organizer MUST be notified in advance of the event in writing to avoid incurring a charge. Delegate substitutions may NOT be made at the event. If you do not attend the event or notify us of your intention to cancel, the full fee will still be payable. Delegates are responsible for organizing and paying for their own transportation, insurance and accommodation, in all instances. If the conference or associated work shops and evening events need to rescheduled for any reason, the fees will be applied to the new dates. If any event is cancelled or postponed, the event organizers do not accept any responsibility for airfare, hotel, and or any other costs incurred by the delegate, speaker or sponsor. Content, speakers, order and times are subject to change. All attendees must register in advance of the events. Register today and revisit these tabs conference, workshops and receptions for updates. * Space is limited. The organizers are monitoring registrations periodically and may need to close registration. Some registered delegates may be asked to be present in a second board conference room that will have live video and audio feed to the main conference or conference room G/H and or attend in a third board room to watch and hear via live audio/video feed. Additional rooms and space adjacent to the main conference room are places to relax, network, meet one on one, for quiet phone conversations, or work. Visit SME's Bookstore Catalog for a selection of informative SME economic and business texts about mining.